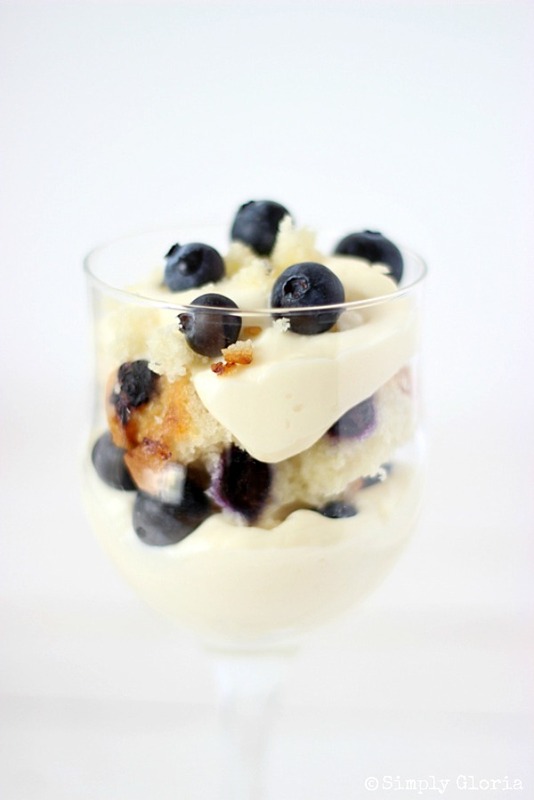 A creamy cheesecake filling layered with pieces of moist blueberry muffins and fresh blueberries. This No Bake Blueberry Muffin Cheesecake Trifle is a scrumptious dessert to enjoy all summer long! It’s that time of year for no bake desserts! And, I’ve got a blueberry-licious one for YOU. Not even any skills are needed to prepare this tantalizing sweet treat. It’s so simple… and so ever delicious! 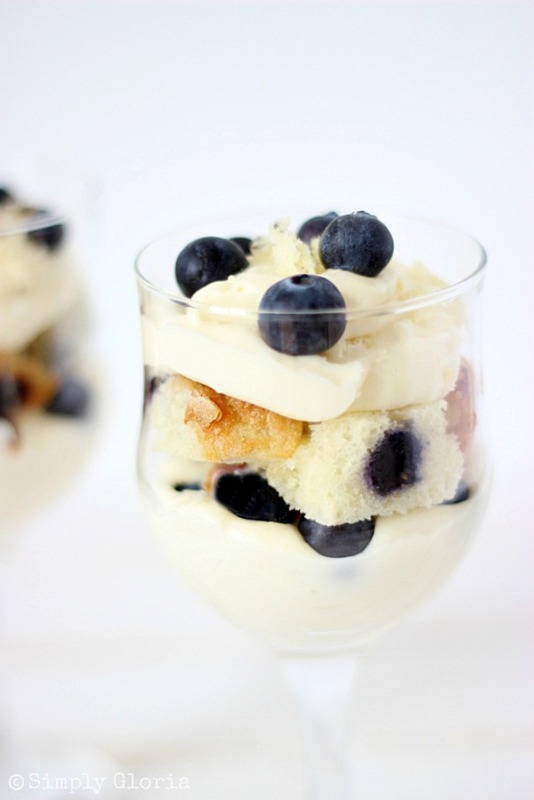 The No Bake Blueberry Muffin Cheesecake Trifle will satisfy that sweet craving. I have to admit, I don’t really dig plain blueberries. Not when they are all alone. As with the bananas on the Bananas Foster Cookie Pizza. My fruit has to be surrounded by total sweetness! Moist blueberry muffins are my favorite. Put these two together with fresh blueberries… and you have a layered no bake summer dessert! 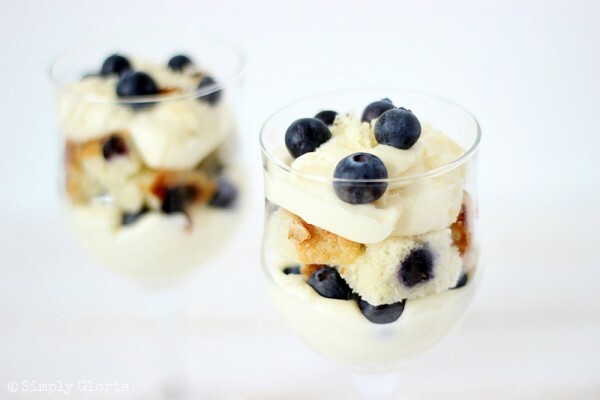 I’m serious when I say that this blueberry trifle is to the extreme amazing. You might just be licking the last bit out of your glass! Cut or break apart pre made muffins into large bite size pieces. Set aside. In a large mixing bowl, mix together cream cheese, heavy cream and milk with a hand mixer or stand mixer using a whisk attachment. Add in the lemon juice. Sprinkle in the cheesecake instant pudding mix. Continue to mix for about 3-5 minutes. Layer cheesecake filling into the bottom of 6-8 individual glasses or one large glass bowl. Add fresh blueberries. Then layer pieces of the muffins. Spoon more cheesecake filling on top of the muffins pieces. Add more blueberries. Garnish with muffins crumbs. Refrigerate up to 3 days, covered. Serves 6-8. Can’t say no to cheesecake! This looks amazing!! I am all over this recipe! Simple, fast, all of my favorite ingredients are include and pretty. BTW….this is the only way I think a trifle should be served. I have a draft waiting for me to hit publish about my thoughts on trifles! I am gonna have to link this to mine to show how perfect this one is! 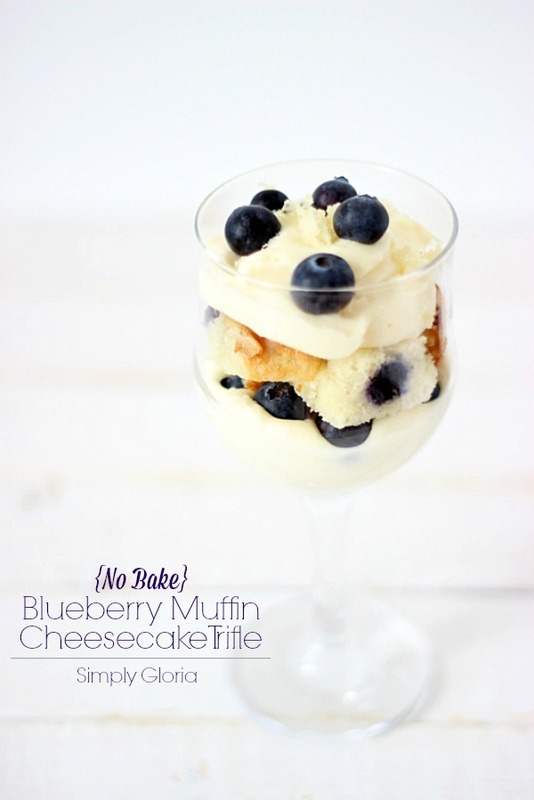 I absolutely love no-bake desserts, especially when cheesecake and berries are involved! Love this trifle, Gloria! A perfect dessert for the holiday weekend! Yum, this looks too good to eat!! I love this recipe, it is getting way too hot here to be cooking!! 🙂 Pinned! Umm YUUUUUM! Blueberry muffins and cheesecake?!?! Sign me up!! Oooh – what a great trifle! 🙂 Good thing they’re in single serving size!! Gloria, yum, what a perfect spring/summer treat and you totally had me at no bake! This looks absolutely scrumptious! Pinning! Have a wonderful Thursday! Gloria! Love, love, how simple this looks and how yummy! I love cheesecake too:) Have a great day. Gloria!! This looks so yummy! I love that it is so easy as well. Definitely up my alley. Thanks for sharing! Erm, these look amazing! Definitely going to have to give them a try. Kerry recently posted…Making Pancakes Is Hard! I could eat simple trifles like this all-the-time!! These are so dainty and pretty Gloria!! Yum – These look amazing! I pinned it so I don’t forget to try them out. These trifles look incredible Gloria! I love no-bake desserts especially on those hot summer days. 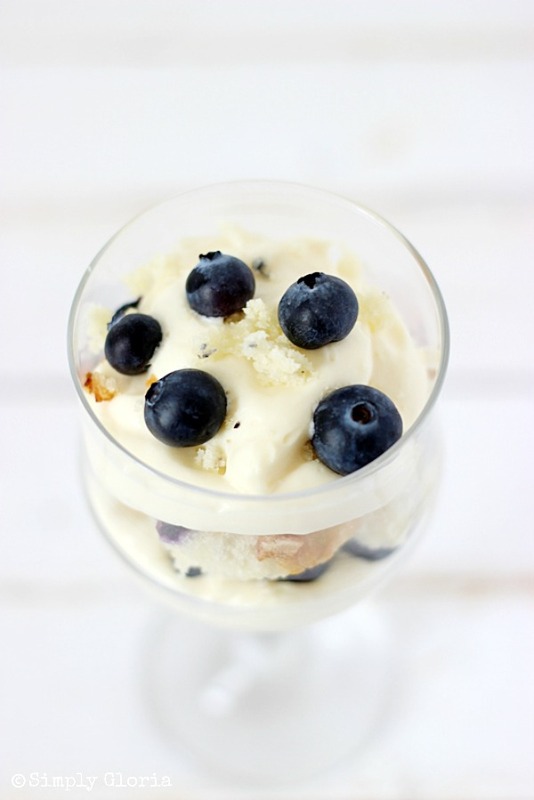 Blueberries and cheesecake sound like a match made in heaven! Love this – pinned! What a perfect no-bake treat! Just in time for hot summer days. Thank you for sharing Gloria. Just lovely! This is the perfect summer treat Gloria. Love this so much. The flavors!!! I heart no bake recipes and cheesecake! This is a sure winner! This looks amazing! I love the no bake part too!!! yum! Rachel @ BubblyNatureCreations.com recently posted…Red, White, and Blueberry Cream Puff Cake! 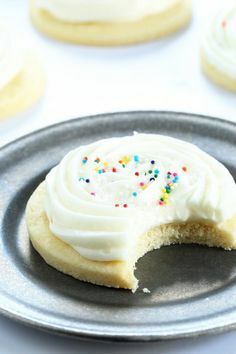 What an irresistible treat! Thanks for linking up with What’s Cookin’ Wednesday!